The first thing you have to know when you’re getting into buy and hold real estate investing is that as a landlord it is not IF you have to deal with evicting someone, but WHEN you will have to deal with evicting someone. Going into a tenant eviction alone can be a wide mixture of emotions ranging but not limited to excitement, fear, anxiety and nervousness. Similar to going to your first day of school or on that first date. The eviction process can be awful and aggravating when going at it alone and below are some lessons learned from other first time eviction process landlords. If you read through this article and decide “I really don’t want to go through this learning curve,” then you might consider getting a pro to help you through the process and save a lot of headaches, time and a lot of money. The amazing team at www.fastevictionservice.com is always available 24/7 to help get you started. If you fail to prepare yourself the correct way, your eviction can get out of hand cost wise very quickly. We’re talking about multiple month’s rent, serving fee, eviction fee to the Sheriff’s department, moving fee (in the case you have to forcefully remove the tenant), storage fees. As you can see, evictions can have a lot of hidden costs if you don’t consult with an eviction attorney to get the process done as swiftly and diligently as possible. Talk to an eviction specialist before you begin the process to cut down time. In your case, time does equal money, and a lot of it. The typical eviction without a specialist can take anywhere between 4-6 months. This is rent money that is very difficult to recoup. Even after you successfully remove the tenant, it’s another long process to recover partial or on rare occasions all of your losses. Statistics show that hiring a landlord eviction attorney can drastically cut down the time in half with a tenant eviction which means saving a lot of money in the long run. Once you decide you are going to evict a tenant, you need to throw emotion out of the window and stick to strictly business. You cannot let your feelings get in the way of achieving your ultimate goal: run a profitable business. Don’t assume your tenant will receive their final notice to vacate and say “oh, okay. I better start making plans on where I’m going to go.” Remember that the eviction process seems to favor the tenant and they don’t think that this process is actually going to work and they don’t think the sheriff will actually forcefully remove them. Once the eviction process gets to this point, things generally get very ugly very quickly. You need to prepare yourself for the fact that the tenant is still under the idea that “you can’t just throw me out on the street.” Tell them to have a moving company ready and a storage facility set to receive your unit’s contents. On eviction day, you need to just make yourself think that the entire day is going to be invested in recovering your rental unit. You need to coordinate with the movers, the Sheriff’s department and the storage facility. Once the Sheriff turns your unit back over to you, begin the process immediately and do not let emotion rule over you. Once your rental is back on the market, you might want to consider suing your ex tenant in small claims to recover some of your losses. Every case will be different, but with some luck, you might be able to garnish wages and eventually recover some of your losses. Most landlords however, go through the process but remain skeptical about getting any money back. They mostly do it to prevent future landlords getting involved with this specific tenant, as the small claims and eviction will remain on this person’s record. Some landlords praise the “cash for keys” method which works a lot more often than you would like to think. Most of the time, evictions begin for lack of paying rent which you can say nine times out of ten is due to the tenant’s lack of funds. Cash for keys is when the landlord literally offers cash to the tenant in exchange for control of the rental unit and keys. It’s typically a win-win situation because the landlord avoids the eviction process all together, and the tenant (usually in the form of returning their security deposit) gets cash and time to move out in an orderly fashion. This is true for tenants who think logically, however, and doesn’t always work. In the case where it does work, you as the landlord should keep in mind that you should only hold up your end of the deal once all their belongings are physically out of the rental unit, and you have them sign a notice that both parties are satisfied with the “cash for keys” agreement. Throughout the entire process, you will be angry, stressed and definitely not thinking about the well-fare of your problematic tenant. All you want is for it to be over, you want them out and you want to move on with your life. The fact is, at the end of the eviction road, you are kicking a family out of their home and this could take an emotional toll on you. It is hard to watch the Sheriff sometimes physically having to remove someone while their children observe close by. Many landlords think it is unfair to have to go through this process but many also have a firm believe it is a shame that some tenants take advantage of the fact that this process is favorable to them. This is why it is very important to have a strong understanding of the entire eviction process as landlords. This will happen to you as a landlord and you can never be fully prepared and it’s not something you can just get used to. 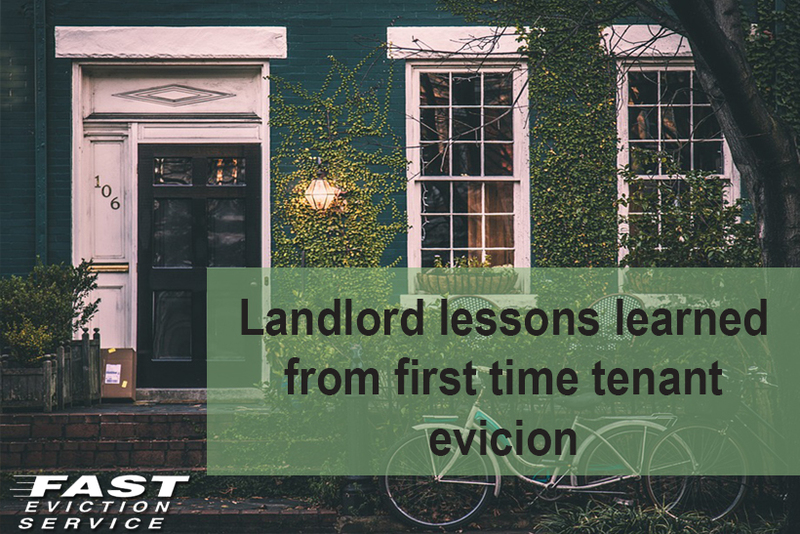 Learning some lessons from first time evictions can help and most landlords will agree that it’s much easier to hire some professional help like the pros at www.fasteviction.com .